Insolation is the power received on Earth per unit area on a horizontal surface. Not to be confused with `insulation.’ It depends on the height of the Sun above the horizon. The solar irradiance integrated over time is called solar irradiation, solar exposure or insolation. However, insolation is often used interchangeably with irradiance in practice. The SI unit of irradiance is watt per square meter (W/m2). An alternate unit of measure is the Langley (1 thermochemical calorie per square centimeter or 41,840 J/m2) per unit time. The solar energy industry uses watt-hour per square metre (Wh/m2) divided by the recording time. 1 kW/m2 = 24 kWh/(m2 day). Irradiance can also be expressed in Suns, where one Sun equals 1000 W/m2 at the point of arrival. Part of the radiation reaching an object is absorbed and the remainder reflected. Usually the absorbed radiation is converted to thermal energy, increasing the object’s temperature. Manmade or natural systems, however, can convert part of the absorbed radiation into another form such as electricity or chemical bonds, as in the case of photovoltaic cells or plants. The proportion of reflected radiation is the object’s reflectivity or albedo. One sunbeam one mile wide shines on the ground at a 90° angle, and another at a 30° angle. The oblique sunbeam distributes its light energy over twice as much area. Insolation onto a surface is largest when the surface directly faces (is normal to) the sun. As the angle between the surface and the Sun moves from normal, the insolation is reduced in proportion to the angle’sCosine; see Effect of sun angle on climate. This ‘projection effect’ is the main reason why Earth’s polar regions are much colder than equatorial regions. On an annual average the poles receive less insolation than does the equator, because the poles are always angled more away from the sun than the tropics. At a lower angle the light must travel through more atmosphere. This attenuates it (by absorption and scattering) further reducing insolation at the surface. Direct insolation is measured at a given location with a surface element perpendicular to the Sun. It excludes diffuse insolation (radiation that is scattered or reflected by atmospheric components). Direct insolation is equal to the irradiance above the atmosphere minus the atmospheric losses due to absorption and scattering. While the irradiance above the atmosphere varies with time of year (because the distance to the sun varies), losses depend on time of day (length of light’s path through the atmosphere depending on the Solar elevation angle), Cloud cover, Moisture content and other contents. (See values for direct and total insolation further down.) Insolation affects plant metabolism and animal behavior. Diffuse insolation is the contribution of light scattered by the atmosphere to total insolation. A Pyranometer, a component of a temporary remote meteorological station, measures insolation on Skagit Bay, Washington. Average annual solar radiation arriving at the top of the Earth’s atmosphere is roughly 1366 W/m2. The radiation is distributed across the electromagnetic spectrum. About half is infrared light. The Sun’s rays areattenuated as they pass through the atmosphere, leaving maximum normal surface irradiance at approximately 1000 W /m2 at sea level on a clear day. When 1367 W/m2 is arriving above the atmosphere (as when the earth is one astronomical unit from the sun), direct sun is about 1050 W/m2, and global radiation on a horizontal surface at ground level is about 1120 W/m2. The latter figure includes radiation scattered or reemitted by atmosphere and surroundings. The actual figure varies with the Sun’s angle and atmospheric circumstances. Ignoring clouds, the daily average insolation for the Earth is approximately 6 kWh/m2 = 21.6 MJ/m2. , the theoretical daily-average insolation at the top of the atmosphere, where θ is the polar angle of the Earth’s orbit, and θ = 0 at the vernal equinox, and θ = 90° at the summer solstice; φ is the latitude of the Earth. The calculation assumed conditions appropriate for 2000 A.D.: a solar constant ofS0 = 1367 W m−2, obliquity of ε = 23.4398°, longitude of perihelion of ϖ = 282.895°, eccentricity e = 0.016704. Contour labels (green) are in units of W m−2. The distribution of solar radiation at the top of the atmosphere is determined by Earth’s sphericity and orbital parameters. This applies to any unidirectional beam incident to a rotating sphere. Insolation is essential for numerical weather prediction and understanding seasons and climate change. 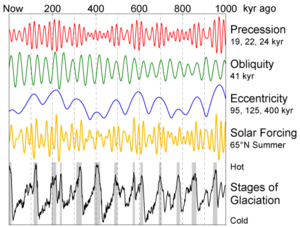 Application to ice ages is known as Milankovitch cycles. can be calculated for any latitude φ and θ. Because of the elliptical orbit, and as a consequence of Kepler’s second law, θ does not progress uniformly with time. Nevertheless, θ = 0° is exactly the time of the vernal equinox, θ = 90° is exactly the time of the summer solstice, θ = 180° is exactly the time of the autumnal equinox and θ = 270° is exactly the time of the winter solstice. Total solar irradiance (TSI) changes slowly on decadal and longer timescales. The variation during solar cycle 21 was about 0.1% (peak-to-peak). In contrast to older reconstructions, most recent TSI reconstructions point to an increase of only about 0.05% to 0.1% between the Maunder Minimum and the present. Ultraviolet irradiance (EUV) varies by approximately 1.5 percent from solar maxima to minima, for 200 to 300 nm wavelengths. However, a proxy study estimated that UV has increased by 3.0% since the Maunder Minimum. Some variations in insolation are not due to solar changes but rather due to the Earth moving between its perigee and apogee, or changes in the latitudinal distribution of radiation. These orbital changes orMilankovitch cycles have caused radiance variations of as much as 25% (locally; global average changes are much smaller) over long periods. The most recent significant event was an axial tilt of 24° during boreal summer near the Holocene climatic optimum. The space-based TSI record comprises measurements from more than ten radiometers spanning three solar cycles. All modern TSI satellite instruments employ active cavity electrical substitution radiometry. This technique applies measured electrical heating to maintain an absorptive blackened cavity in thermal equilibrium while incident sunlight passes through a precisionaperture of calibrated area. The aperture is modulated via a shutter. Accuracy uncertainties of <0.01% are required to detect long term solar irradiance variations, because expected changes are in the range 0.05 to 0.15 W m−2 per century. Disagreement among overlapping observations indicates unresolved drifts that suggest the TSI record is not sufficiently stable to discern solar changes on decadal time scales. Only the ACRIM composite shows irradiance increasing by ∼1 W m−2 between 1986 and 1996; this change is also absent in the model. For ACRIM, NIST determined that diffraction from the view-limiting aperture contributes a 0.13% signal not accounted for in the three ACRIM instruments. This correction lowers the reported ACRIM values, bringing ACRIM closer to TIM. In ACRIM and all other instruments, the aperture is deep inside the instrument, with a larger view-limiting aperture at the front. Depending on edge imperfections this can directly scatter light into the cavity. This design admits two to three times the amount of light intended to be measured; if not completely absorbed or scattered, this additional light produces erroneously high signals. In contrast, TIM’s design places the precision aperture at the front so that only desired light enters. TIM’s high absolute accuracy creates new opportunities for measuring climate variables. TSI Radiometer Facility (TRF) is a cryogenic radiometer that operates in a vacuum with controlled light sources. L-1 Standards and Technology (LASP) designed and built the system, completed in 2008. It was calibrated for optical power against the NIST Primary Optical Watt Radiometer, a cryogenic radiometer that maintains the NIST radiant power scale to an uncertainty of 0.02% (1σ). As of 2011 TRF was the only facility that approached the desired <0.01% uncertainty for pre-launch validation of solar radiometers measuring irradiance (rather than merely optical power) at solar power levels and under vacuum conditions. TRF encloses both the reference radiometer and the instrument under test in a common vacuum system that contains a stationary, spatially uniform illuminating beam. A precision aperture with area calibrated to 0.0031% (1σ) determines the beam’s measured portion. The test instrument’s precision aperture is positioned in the same location, without optically altering the beam, for direct comparison to the reference. Variable beam power provides linearity diagnostics, and variable beam diameter diagnoses scattering from different instrument components. The most probable value of TSI representative of solar minimum is 1360.8 ± 0.5 W m−2, lower than the earlier accepted value of 1365.4 ± 1.3 W m−2, established in the 1990s. The new value came from SORCE/TIM and radiometric laboratory tests. Scattered light is a primary cause of the higher irradiance values measured by earlier satellites in which the precision aperture is located behind a larger, view-limiting aperture. The TIM uses a view-limiting aperture that is smaller than precision aperture that precludes this spurious signal. The new estimate is from better measurement rather than a change in solar output. A regression model-based split of the relative proportion of sunspot and facular influences from SORCE/TIM data accounts for 92% of observed variance and tracks the observed trends to within TIM’s stability band. This agreement provides further evidence that TSI variations are primarily due to solar surface magnetic activity.